While I do not think Kickstarter is necessarily stealing money from 99 cent app developers, I do remain skeptical of a some of the stuff being offered up for financing. Sure, some of the stuff is great. It was all I could do to keep myself from throwing money at the Steve Jackson Games Ogre Designers Edition kickstarter. I played Ogre and G.E.V. back when they were in zip-lock baggies at the hobby shop on the peg next to Snit’s Revenge. Only the realization that I did not need another huge board game I would never play overcame nostalgia and stayed my hand. But Steven Jackson Games is a known quantity to me. I trust them to do what they say. Likewise, I trust that Jason Scott will produce the three documentaries that I helped fun. It would be way, way outside his behavior norms to not do so. Other teams I remain less sure of. Despite being a fan of the original Wasteland, I could not bring myself to toss money in for Wasteland 2. I’ll be happy if it comes out. I just don’t have any sort of way to evaluate the chances that team can pull it off or whether the game can make the transition directly from 1988 to 2014 and retain the same spirit. Some games are only great within the constraints of their time frame and technology. And I am waiting for the big crash, some big seven figure funding effort that fails to deliver. It will happen. You know it. So my donations via Kickstarter are few and far between. But today, thanks to Zubon, I have one I cannot resist. Defense Grid: The Awakening is one of my all time favorite tower defense games. It is simple, clever in a Valve sort of way, looks good, plays well, and has all manner of different modes to play and defeat once you make it through the main storyline. My hours played for the game, as measured by Raptr, are at the MMO end of the spectrum. Well, Hidden Path Entertainment, the makes of the game, want to make Defense Grid 2. However, according to their tale of events, normal funding paths just are not panning out for the indie level profit margins. So they have gone to Kickstarter. They have thought this out. They have four levels of goals ($250K, $500K, $750K, and 1 million dollars), each of which will yield up a different result. They have the many levels of support, each with various and sundry cool things. And they have a video with endorsement from other game developers. But here is the key. For the minimum pledge of $15 you get a key to unlock the original game on Steam. It is a $20 game, and you get that. And you get it the moment you pledge. And you get to keep it even if they don’t fund. 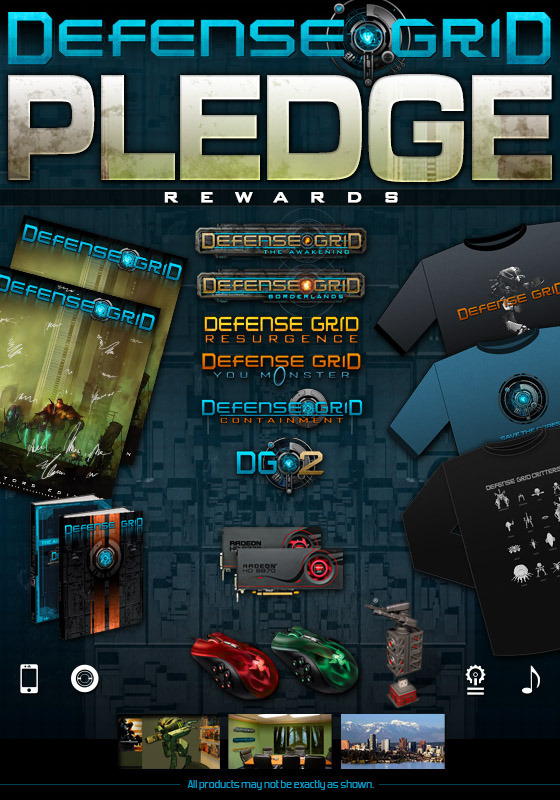 So even if this turns out to be vaproware, you are ahead at the base pledge. Plus, you get a copy of whatever software they end up being able to fund. So if it succeeds, you get the new stuff too. Of course, I would prefer that you go pledge more money. I would really like to see this run off the end and fully fun. Still, if you were thinking about getting the original game, go support it on Kickstarter. You can have it now. I have already pledged and have a code for the game. Of course, I already own the game. I will have to have a contest or something at some point to dispose of the code. But after the Kickstarter funding closes. That runs until August 14th. TL;DR – Go here, give money. This entry was posted in entertainment, Kickstarter, Other PC Games and tagged Defense Grid 2, Defense Grid: The Awakening, Ogre, Steve Jackson Games, Wasteland, Wasteland 2 on July 31, 2012 by Wilhelm Arcturus.